Thursday's first-round game between the Michigan Wolverines and Montana Grizzlies in the 2019 NCAA Tournament is a rematch of a Round of 64 game last year won by the Wolverines, 61-47. Michigan (28-6), the 2-seed in the West, is coming off a 65-60 loss to Michigan State in the Big Ten Tournament title game. Meanwhile, Montana (26-8), the 15-seed, rallied from a 12-point deficit to beat Eastern Washington in the Big Sky Tournament final. Tipoff is at 9:20 p.m. ET on Thursday at Wells Fargo Arena in Des Moines, Iowa. The Wolverines are favored by 14.5 in the latest Michigan vs. Montana odds, while the over-under for total points is 129.5. Before making any Michigan vs. Montana picks of your own, see the NCAA Tournament predictions from the SportsLine Projection Model. Now the model has locked in on Michigan vs. Montana. We can tell you it is leaning over, and it has also generated an against-the-spread pick that cashes in well over 50 percent of simulations. That one is only available at SportsLine. The model has factored in the Wolverines' elite defense. Michigan has the second-best defensive efficiency rating in the country, according to KenPom. 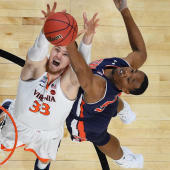 Opponents are scoring just 58.6 points per game against the Wolverines, which ranks second in the country behind only Virginia. In addition, teams shoot only 39.9 percent against Michigan, which ranks 20th. In last year's game against Montana, a Wolverines team that wasn't as accomplished defensively limited the Grizzlies to 18-of-56 shooting (32.1 percent), including 7-of-28 in the second half. At one point, Montana missed 12 straight shots and went without a point for almost 10 minutes. But just because the Wolverines beat the Grizzlies last year in the first round of the NCAA Tournament does not mean they will win or even cover the Michigan vs. Montana spread on Thursday. The model also knows the Grizzlies are one of the most accurate teams in the country. They shoot 49.7 percent from the field, eighth-best in the nation, and have made at least half of their shots 19 times this season. They also make 38 percent of their 3-pointers, which ranks 30th. Montana's accuracy was on full display in the Big Sky Tournament win over Eastern Washington. The Grizzlies made 27-of-53 shots from the field (50.9 percent) and 9-of-20 3-pointers (45 percent) in a 68-62 win. Junior guard Sayeed Pridgett has been particularly hot, averaging 20.1 points over his last 13 contests. Overall, he shoots an absurd 61 percent, which ranks 19th in the country. So who wins Montana vs. Michigan? And which side of the spread can you bank on in well over 50 percent of simulations? Visit SportsLine now to see which side of the Montana vs. Michigan spread to jump on, all from the advanced model that's up more than $4,000 on top-rated college basketball picks the past two seasons.